^ 大プリニウス iii. 3. s. 4. ^ （スペイン語） habitathumano.com Archived 2007年2月21日, at the Wayback Machine. 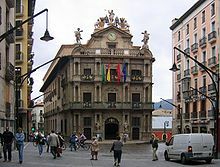 ^ （スペイン語） History of the Airport of Pamplona, by Aena Archived 2012年2月23日, at the Wayback Machine.